In 2017, America’s Public Television Stations (APTS) received a grant from the California Governor’s Office of Emergency Services (Cal OES). The purpose of the APTS grant was to create a pilot project that explores the use of PBS broadcast airways to distribute earthquake early warnings, known as ShakeAlerts, as part of the California Earthquake Early Warning Program (CEEWP) at Cal OES in partnership with the United States Geological Survey (USGS). 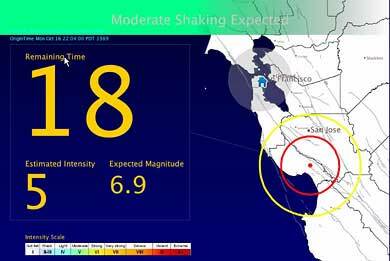 The grant enabled five California Public Broadcasting Service (PBS) stations, which were chosen based on high population density, with equipment to receive and retransmit ShakeAlerts via datacasting. Datacasting is technology that delivers messages in parallel with the PBS television video and audio. Data inserted into the TV broadcast signal is ignored by televisions but received and processed by specialized datacasting receivers. Datacasting equipment deployed to each enabled PBS broadcast facility will receive the USGS published ShakeAlert and insert it in the PBS transmission. The datacasting receiver will detect the message and trigger automated actions accordingly. Actions could include alerting the public, closing a gas valve, opening a fire station door, or closing a gate to prevent traffic from entering a tunnel or a bridge. The sooner ShakeAlerts are received, the more beneficial they are to recipients, so technology solutions must meet stringent low latency requirements. After solidifying project requirements, the final system design required significant modifications to both the hardware and software components of the FlexStream™ datacasting system. West Pond Technologies (WPT) made the modifications and supplied a fully functional datacasting solution to APTS on time and within budget. By the summer of 2018, this solution was implemented and provided a fully functional datacasting system for each of the five PBS stations. In September 2018, APTS publicly demonstrated WPT’s datacasting system for rapid alerts. The five installed datacasting systems are fully functional and ready to receive ShakeAlerts when published by the USGS. Currently, specialized receivers are in the beginning stages of development so that institutional users and individuals can receive ShakeAlerts via datacasting once EEW is available to the public. West Pond continues to work with APTS to promote datacasting, create application specific technology demonstrations, and support third parties interested in developing related products.